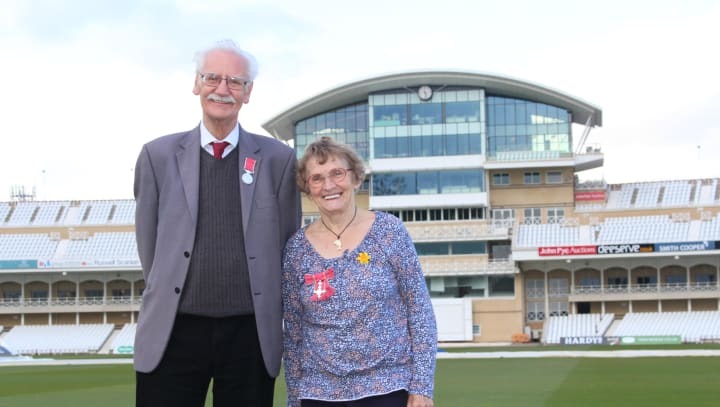 Two Nottinghamshire cricket icons have been showing off their medals on the hallowed Trent Bridge turf after picking up the gongs they were awarded in the Queen’s New Year Honours List. Enid Bakewell, a pioneering figure in women’s cricket and a World Cup winner, was awarded an MBE, while Peter Wynne-Thomas, the long-serving Trent Bridge librarian and historian, was given a British Empire Medal. Bakewell was presented with her medal by Princess Anne in a ceremony at Buckingham Palace, which she says made the experience all the sweeter. “Princess Anne gave us our World Cup winner’s medals in 1973, after we beat the Aussies at Edgbaston, so I was over the moon that it was her again. “She asked me about the women’s game, and was interested in how it was progressing with the England team winning the World Cup again a couple of years ago and new leagues cropping up all over the world. It may now be over 50 years since Bakewell’s international debut, but her passion for watching and playing the game remains undiminished. Wynne-Thomas, meanwhile, was honoured by the Lord Lieutenant at Nottingham’s Council House for his lifelong service to cricket and the community in the county. He has built up the Trent Bridge library to its current size as the second-largest collection of its kind in the world, boasting over 25,000 items. He has also written numerous books on the history of cricket in Nottinghamshire, and helps to inspire the next generation of cricket-lovers through his engaging talks to groups of schoolchildren. “It was a very proud moment for me and my wife, and we’re also looking forward to a celebratory garden party at Buckingham Palace,” said Wynne-Thomas on receiving the medal. “I’ve always been keen on getting as many people as possible involved in cricket, stemming right back to banging on doors to persuade people to become part of the village team I ran many years ago.